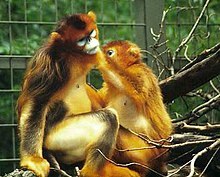 Type species: Semnopithecus roxellana Milne-Edwards, 1872, by monotypy. Type species: Rhinopithecus avunculus Dollman, 1912, by original designation. Included in Pygathrix by Groves (1970) and Szalay & Delson (1979: 404); but see Jablonski & Peng (1993) and Groves (2001c), who recognized that the two are sister-groups but retained them as separate genera. Jablonski & Peng (1993) recognized Presbytiscus as a valid subgenus. Milne-Edwards, A. 1872. Mémoire de la faune mammalogique du Tibet Oriental et principalement de la principauté de Moupin. Pp. 231–379 in Milne-Edwards, H. (ed. ), Recherches pour servir à l’histoire naturelle des mammifères: comprenant des considérations sur la classification de ces animaux. 2 volumes. G. Masson: Paris. Volume I: BHL (text); Volume II: BHL (atlas). Reference page. Pocock, R.I. 1924. A new genus of monkeys. Proceedings of the Zoological Society of London 1924: 330–331. Rhinopithecus in Mammal Species of the World. For more multimedia, look at Rhinopithecus on Wikimedia Commons.